rigorousintuition.ca • View topic - americas war of terror: now it's syria's turn..
americas war of terror: now it's syria's turn.. The US has neither confirmed nor denied the incident. It has previously accused Syria of allowing foreign militants into Iraq. Syria has summoned the US and Iraqi envoys in Damascus to protest at the raid. "Syria condemns this aggressive act and holds American forces responsible for this aggression and all of its repercussions," a government official said. Its timing is curious, coming right at the end of the Bush administration's period of office and at a moment when many of America's European allies - like Britain and France - are trying to broaden their ties with Damascus, our correspondent adds. "Four American helicopters violated Syrian airspace around 1645 local time [1345 GMT] on Sunday," Sana said. "American soldiers" emerged from helicopters and "attacked a civilian building under construction and opened fire on workers inside - including the wife of the building guard - leading to [the deaths] of eight civilians", it added. "The helicopters then left Syrian territory towards Iraqi territory," Sana said. The dead include a man, his four children and a married couple, the Syrian report said, without giving details of the children's ages. The village was named as Sukkiraya, 8km (5 miles) from the Iraqi border. A US military spokesman was unable to confirm or deny the reports, saying it was a "developing situation". But later the Associated Press news agency quoted an unnamed US military official in Washington as saying that American special forces had attacked foreign fighters linked to al-Qaeda. The area is near the Iraqi border city of Qaim, a major crossing point for fighters, weapons and money travelling into Iraq to fuel the Sunni insurgency. Washington has in the past accused Damascus of turning a blind eye to the problem. The Iraqi city's mayor, Farhan al-Mahalawi, told Reuters news agency that US helicopters had struck a village on the Syrian side of the border, after which Syrian troops surrounded the site. Syria has condemned an alleged US raid that killed at least eight people in the country's east, close to the border with Iraq, calling it an act of "serious aggression". Damascus was considering its response to the attack, a spokesperson for the Syrian information ministry told Al Jazeera on Monday. "No doubt there will be a reaction [from Syria] of some kind," Reem Haddad told Al Jazeera. The US has not officially responded to Syria's accusation, but an unnamed US military official was reported by The Associated Press as saying that the raid by US special forces targeted al-Qaeda-linked foreign fighters who were moving through Syria into Iraq. The raid on Sunday targeted an area used by fighters responsible for cross-border attacks into Iraq, Ali al-Dabbagh, the Iraqi government spokesman, said on Monday. "The latest of these groups ... killed 13 police recruits in an (Iraqi) border village. Iraq had asked Syria to hand over this group which uses Syria as a base for its terrorist activities." Al-Dabbagh would not say who had carried it out. Following the attack, the Syrian government summoned the senior US and Iraqi envoys to Damascus to protest against the raid, the Syrian Arab news agency (Sana) reported. "This is a flagrant violation of the new [security] agreement between Iraq and the US," Haddad told Al Jazeera. "Because one of the points of that agreement is that they do not attack bordering countries." Syrian state television said four American helicopters raided the village of Sukariya - close to the town of Abu Kamal, 8km inside the Syrian border - before flying back towards Iraqi territory. During the raids, two of the helicopters landed and dropped off eight US soldiers, who then entered a house, Syrian media reported. "American soldiers ... attacked a civilian building under construction and fired at workmen inside, causing eight deaths." The government said that those killed in the raid were workers. Syria TV showed what it said was the injured wife of the building's guard, in bed in hospital with a tube in her nose, saying that two helicopters landed and two remained in the air during the attack. The US and the US-backed Iraqi government frequently accuse Damascus of not doing enough to stop anti-US fighters, including those from al-Qaeda, crossing the border into Iraq. But Syrian analysts say the demands are unfounded. "Syria has one million and a half refugees - it is impossible to make it a full-proof frontier," Samir al-Taqi, director of the Orient Centre for International Studies, a Syrian think-tank, told Al Jazeera. "Syria has requested technical assistance to be able to control [the border with Iraq] and the Americans were reluctant," he said. The Americans failed to reply to all the requests by the Syrian government and to allow the Iraqis to build up security co-ordination across the border." Since the 2003 invasion of Iraq, there have been some instances in which American troops crossed areas of the 600km border in pursuit of fighters. Israeli aircraft have also in the past violated Syria's airspace. Sunday's alleged raid comes just days after the commander of US forces in western Iraq said American troops were redoubling efforts to secure the Syrian border, which he called an "uncontrolled" gateway for fighters entering Iraq. US Major-General John Kelly said on Thursday that Iraq's western borders with Saudi Arabia and Jordan were fairly tight as a result of good policing by security forces in those countries but that Syria was a "different story". Lieutenant-Colonel Chris Hughes, a spokesman for US forces in western Iraq, said the US division that operates on the Iraqi side of the border was not involved in Sunday's incident. Syria's foreign minister has accused the US of an act of "criminal and terrorist aggression" over what it says was a helicopter raid on its territory. 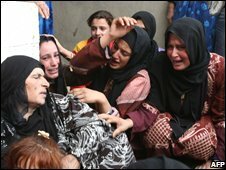 Walid Muallem said Sunday's attack saw four US aircraft travel eight miles inside Syrian airspace from Iraq and kill eight unarmed civilians on a farm. He said those who died were a father and his three children, a farm guard and his wife, and a fisherman. However, a unnamed US official was quoted by the AFP news agency as saying that its forces had mounted a "successful" raid against foreign fighters threatening US forces in Iraq. The US has previously accused Syria of allowing militants into Iraq, but Mr Muallem insisted his country was trying to tighten border controls. Speaking at a news conference in London, Mr Muallem said the raid on the town of Abu Kamal was "not a mistake" and that he had urged the Iraqi government to investigate. "We consider this criminal and terrorist aggression. We put the responsibility on the American government," he told reporters following talks with UK Foreign Secretary David Miliband. He added: "All of them [the victims] are civilians, Syrian, unarmed and they are on the Syrian territories. "Killing civilians in international law means a terrorist aggression." Asked if Syria would use force if a similar operation was mounted, he said: "As long as you are saying if, I tell you, if they do it again, we will defend our terrorities." Referring to the US presidential election, he said: "We hope the coming administration will learn the mistakes of this administration." The US official quoted by AFP said: "Look when you've got an opportunity, an important one, you take it. "That's what the American people would expect, particularly when it comes to foreign fighters going into Iraq, threatening our forces." bigearth wrote: The US official quoted by AFP said: "Look when you've got an opportunity, an important one, you take it. so the american people "expect" dead innocents??? btw, never trust anyone who starts off sentence with the word "look.."
Re: americas war of terror: now it's syria's turn..
RIers: What do we make of it when fake news finds its way onto the Beeb? What does it mean and what can we expect from it? Seeing the world through rose-colored latex.